Join us August 15 for the ACGA Summer Field Day to visit research bogs and discuss results. We are currently conducting experiments to compare the efficacy of various insecticides (Delegate, Altacor, Intrepid, Lorsban, Imidan, and 2 unregistered insecticides) against Sparganothis fruitworm and spotted fireworm larvae in cranberries. Experiment testing efficacy of insecticides against Spargaothis fruitworm and spotted fireworm larvae. 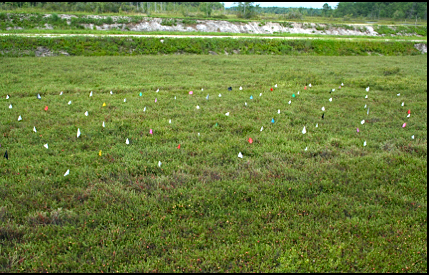 The experiment is being conducted in a cranberry bog cv. ‘Early Black’ located at the Rutgers PE Marucci Center for Blueberry and Cranberry Research and Extension in Chatsworth, New Jersey. Plots are 60 x 60 cm (2 x 2 feet) each, replicated 4 times (see picture). 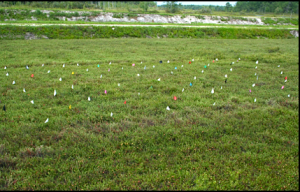 Each plot is separated by a 15 cm (0.5 foot) buffer zone. Treatment applications were made on Tuesday July 23 with a R&D CO2 backpack sprayer, using a 1-liter plastic bottle. The sprayer was calibrated to deliver 50 gal of vol per acre at 30 psi, using a single T-jet VS 110015 nozzle, yielding 17.4 ml (0.6 oz) per plot. At three and seven days after treatment, 3-4 insecticide-treated uprights were inserted in florists’ water picks, enclosed in a ventilated 40-dram plastic vial, and secured on Styrofoam trays (as shown in picture). Three 1st instar larvae were placed in each of 8–10 vials for each treatment. Each vial was considered a replicate. 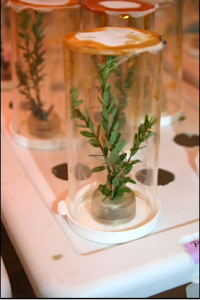 Sparganothis fruitworm and spotted fireworm larvae used in assays were from a colony kept at the Rutgers PE Marucci Center. Plants and insects were then placed in the laboratory at ~25°C, on a 15:9 L:D cycle. Mortality was assessed at 7 days after setup. Results from these experiments will be presented.